Yale University Press, 9780300151190, 336pp. Craftsmanship, says Richard Sennett, names the basic human impulse to do a job well for its own sake, and good craftsmanship involves developing skills and focusing on the work rather than ourselves. The computer programmer, the doctor, the artist, and even the parent and citizen all engage in a craftsman’s work. In this thought-provoking book, Sennett explores the work of craftsmen past and present, identifies deep connections between material consciousness and ethical values, and challenges received ideas about what constitutes good work in today’s world. 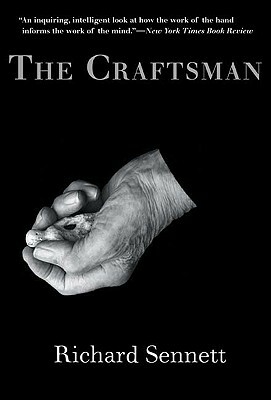 The Craftsman engages the many dimensions of skill—from the technical demands to the obsessive energy required to do good work. Craftsmanship leads Sennett across time and space, from ancient Roman brickmakers to Renaissance goldsmiths to the printing presses of Enlightenment Paris and the factories of industrial London; in the modern world he explores what experiences of good work are shared by computer programmers, nurses and doctors, musicians, glassblowers, and cooks. Unique in the scope of his thinking, Sennett expands previous notions of crafts and craftsmen and apprises us of the surprising extent to which we can learn about ourselves through the labor of making physical things. Richard Sennett is professor of sociology at New York University and at The London School of Economics. Before becoming a sociologist, he studied music professionally. He has received many awards and honors, most recently the 2006 Hegel Prize for lifetime achievement in the humanities and social sciences.